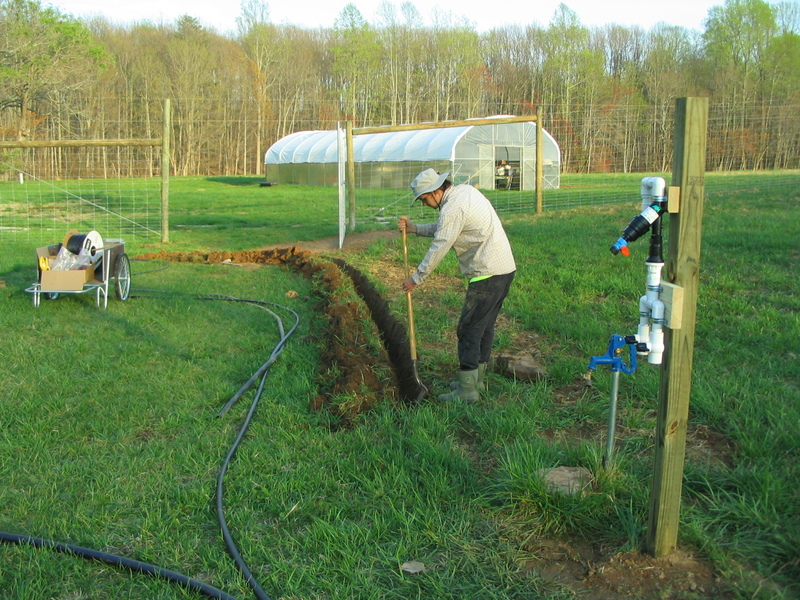 We have been putting in the drip irrigation system over the last several weeks. 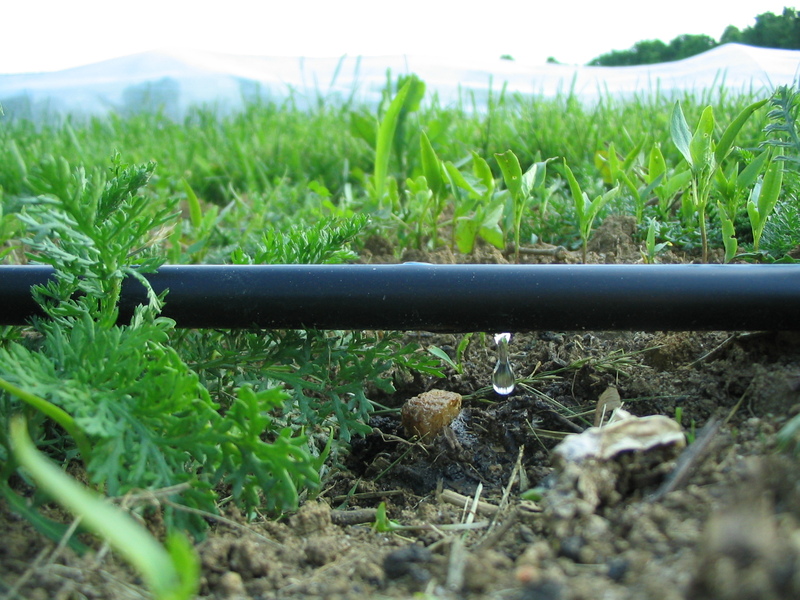 We prefer using drip irrigation instead of overhead irrigation for many reasons. 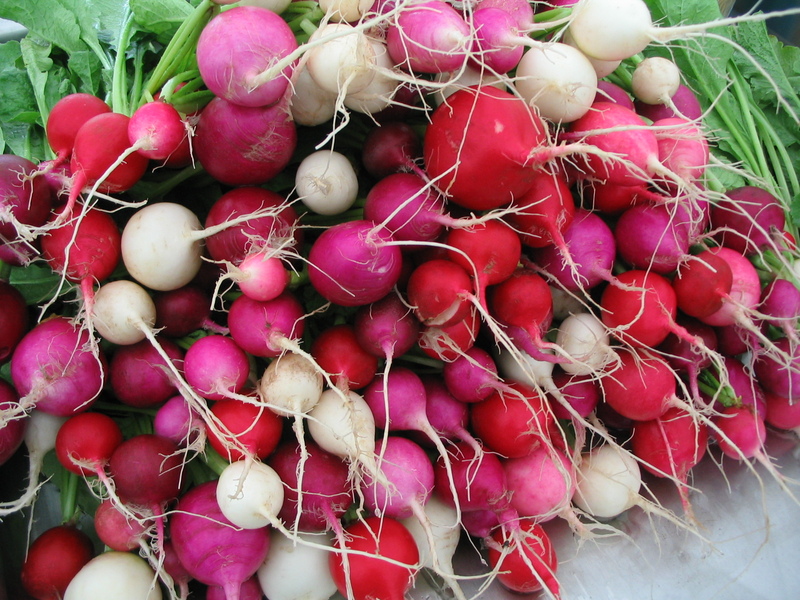 Drip irrigation puts the water only where you want it: in the root zone. This conserves water. You don’t have the problems of excessive evaporation, inadvertently watering the walking paths and creating erosion, or irrigation water being blown about by the wind. It also prevents having diseases spread on wet leaves. On the other hand, with a very densely seeded crop such as salad greens it is hard to wet the entire bed evenly using drip tape. It can also be cumbersome working around the lines. 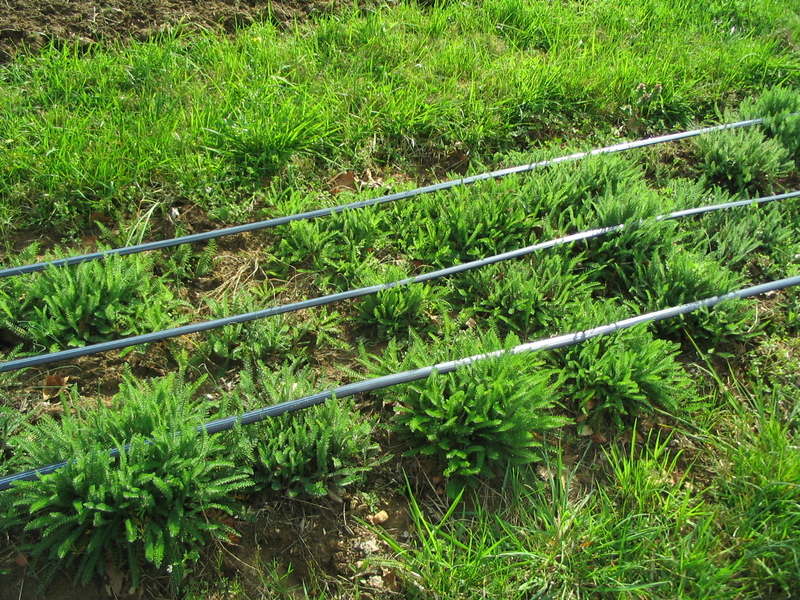 Drip irrigation will only work if you have a good clean source of water (such as a well). Otherwise the emitters will get clogged up. All in all we think the pros outweigh the cons for our growing system. Our bed system will be more or less permanent, but it can be adjusted if necessary. Right now the beds are 5 feet wide with 3 foot grass pathways between. There are three sections of beds; two sections are 45′ long and the western section is 90′ long. So we have four irrigation zones; one for each of the 45′ sections, and the 90′ section is split into two zones. 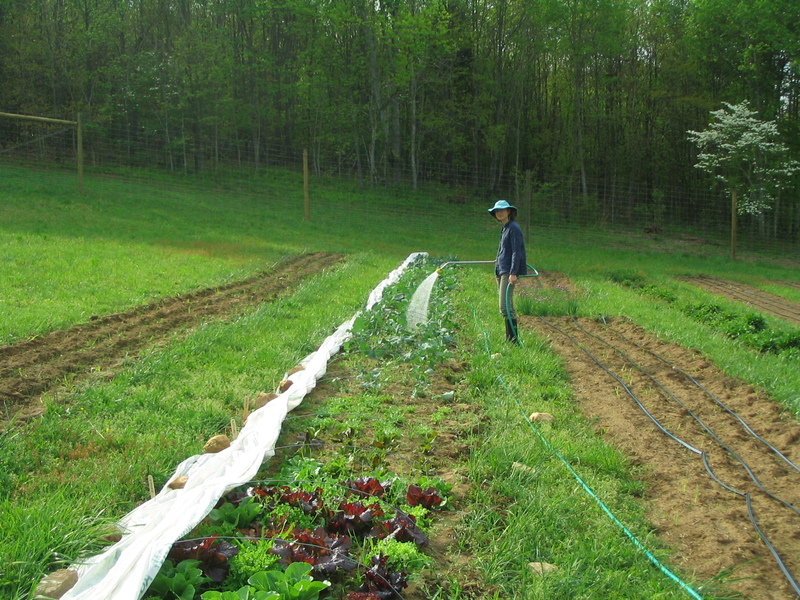 Each bed has two to three drip lines. This adds up to over a mile and half of drip tape! The lines should last about five years. 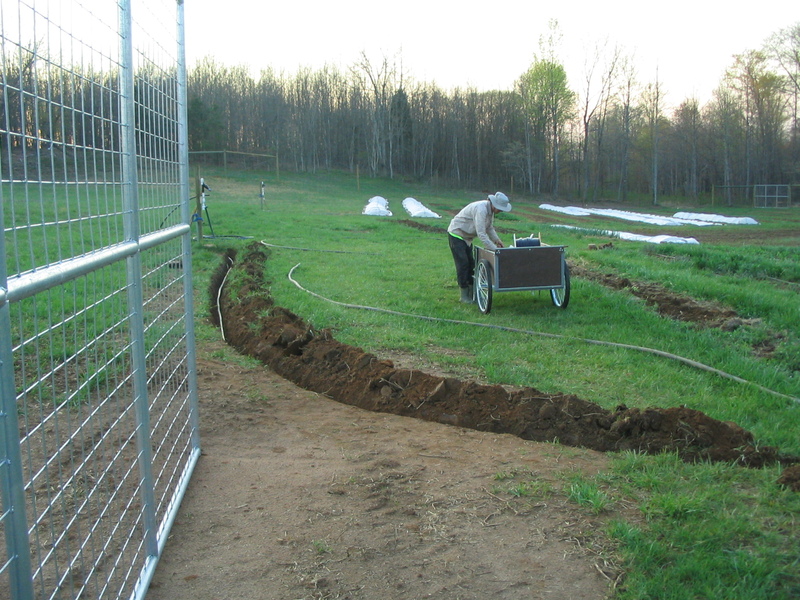 Gavin dug three trenches from the water spigots to where the beds start, so that we can drive the tractor into the garden without crushing the irrigation line. This process started a while ago; when there were no leaves on the trees. Gavin dug up the old water line running from the trailer to the spring. He was able to reuse this pipe as a protective sleeve for the section of the irrigation pipe in the trenches. 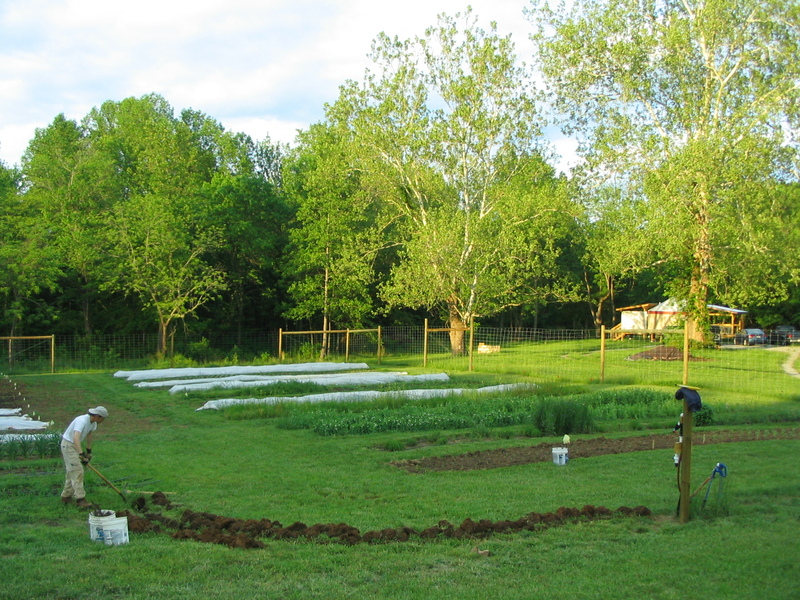 Since we’ve already planted most of the garden, and some beds are filled with perennials from last year, it took a while to put the drip lines on each bed. 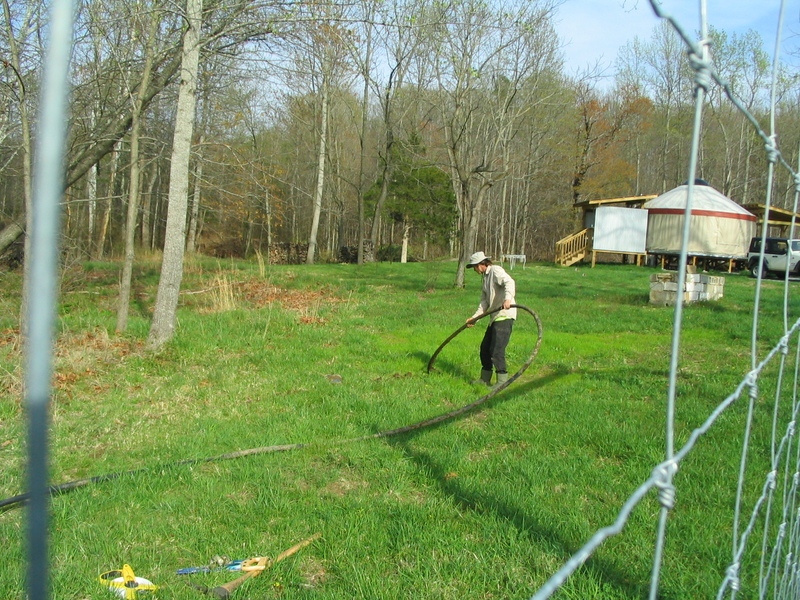 We had to weave in and out of plantings, which was fun. Of course it would have been more efficient to have laid out the irrigation first: before planting. 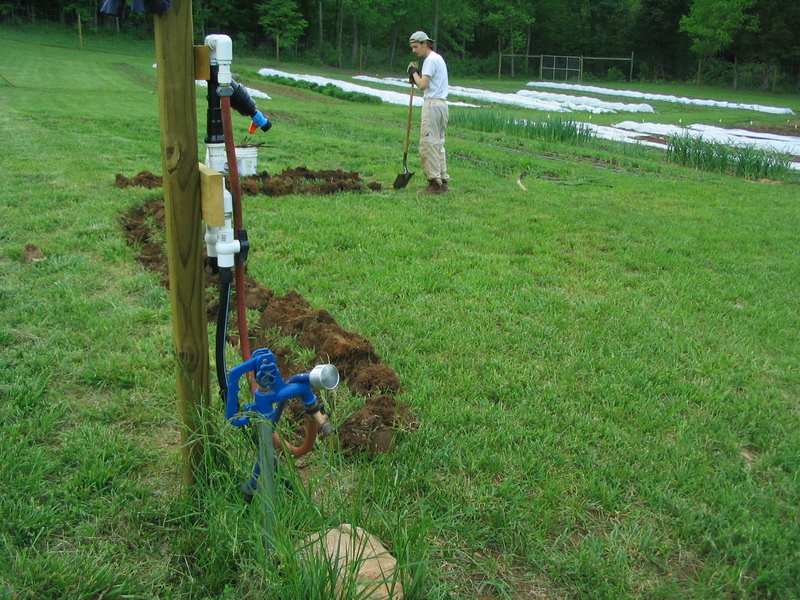 The irrigation manifold for the center and eastern sections of the garden. Digging up the center section pipe trench. 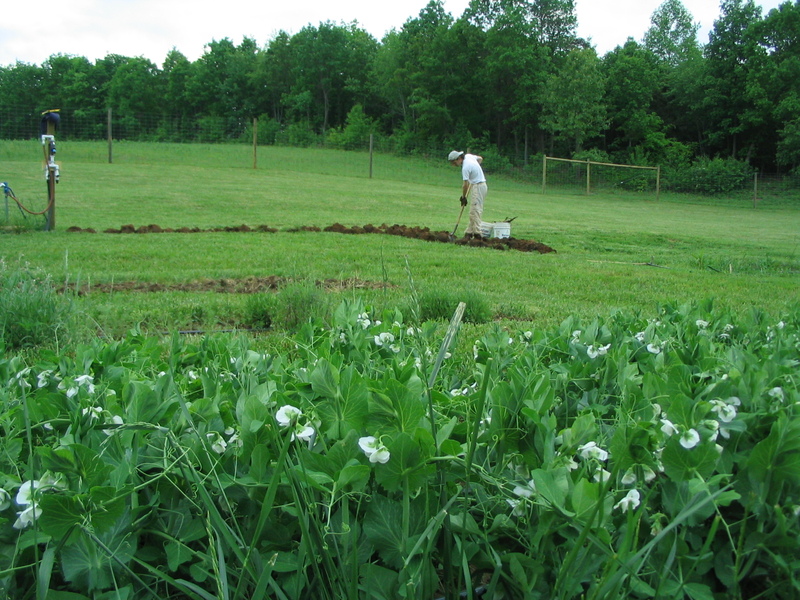 The peas are doing well…thanks in part to the new irrigation system! And up close. It works! 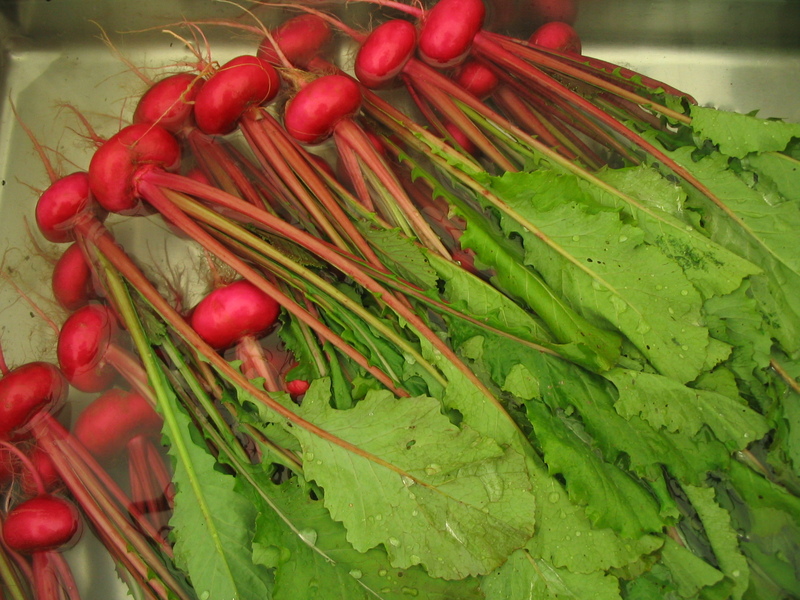 Yesterday we harvested many Easter Egg radishes for market! 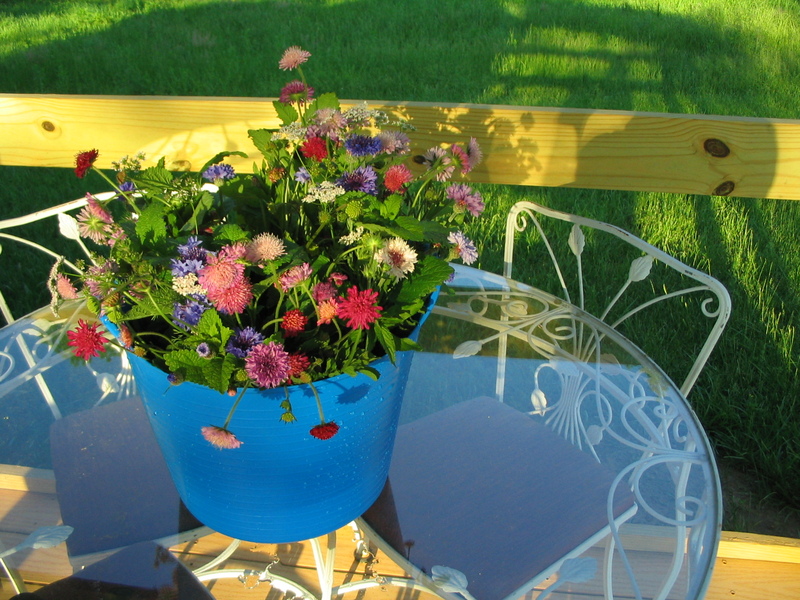 And a few spring bouquets of mint, lemon balm, bachelor’s button, knautia, cilantro, and ageratum.